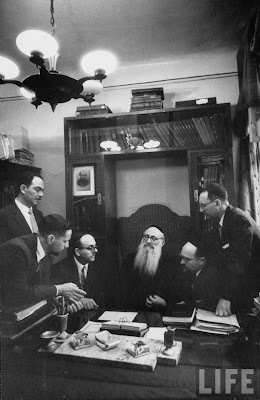 One hora'ah whuch the Rebbe told him in 1956 (befdore the nesee'ah with Rabbi Bomzer shlita (I believe also pictured)) that they should let their beards grow, because in Russia they won't understand a "Rov" un a bord... hence the "Kumetz berdel developiong as peach fuzz on the chin and clearly by some of the others! I got to know Rav Hollander the last 10 years of his life , although I had seen him many years earlier. He was the pioneer in Soviet Jewry work. He established contacts there and visited Russia many times. He also lectured and wrote about his trips, thus bringing the issue of Soviet Jewry to the attention of American Jewry.He wasa friend of the rabbinic community in Russia and was instrumental in bringing Rav Levin from Moscow in 1967 and rav levin spent a Shabbas in the Bronx. He was a Rav in a huge shul in the BRONX, Mt. Eden Jewish Center where hundreds heard his sermons . The grand concourse was the heart of Jewish Bronx.Later he moved to Brighton Beach and dealt with a dwindling congregation. He aws the brother in law of the late R. Moshe Sherer both married sisters the daughtersof Rav Fortman of Far Rockaway. His shvoggers success, affected Rabbi Hollander's personality in different ways. Rabbi Hollander was never involved in teh Aguda, but served as president of the Poalei Aguda for many years. R. Hollander was a Modern orthodox rabbi, he was not yeshivish or chasidic. He graduated YC and RIETS and served as President of the RCA. He was in favor of secular studies. and read daily various newspapers and journals. He differed with many MO rabbis especially men like Rabbonim Rackman and Lookstein over recognition of non orthodox ministers as rabbis. In this he became a 1 issue candidate.He opposed the NY Board of rabbis and the Synagogue Council and after years of battle he emerged the victor ! When I wrote an article in the Algemeiner about Rav Aren Kotler he blasted me the next week in print for not mentioning Reb Aren's anti reform policies. Of course that was true but R. Kotler's real acheivements were the Beth Medrash gavoah and the creation of a rabbinic elite in the US, as well as his activities for the Aguda, and Chinuch Atzmai.But I could not get Rabbi H to understand that. But we became friends, and I assisted him in finding sources and books , and he was very grateful and he believed in hakaras hatov. He wasa Ish Emes, although he wrote for the Algemeiner , he attacked Lubavitch on occassions when young shluchim abandoned the hard line rabbi Hollander erected against non Orthodox rabbis. Girsa dyunkesa. he was of Hungarian extraction and austrit and kavod harrabanus was his hallmark, the apple does not fall far from the tree. A note I heard that it was not the Rebbe who urged them to grow beards, but private jews who had been in Russia told them that in Russia no frum Jew would take them seriously thus the whole group grew a chasimas zaken. Much more to write. To our sorrow he had no children so those who feel close to him should do something to memorialize his personality. Another note the rav in middle of the photo is Rav Shlomo Schlieffer the rav of the Moscow Choral Synagogue and founder of the Yeshiva. he was an eynikel of Rav reines by mattiage. First off I would like to thank you for carrying this story. I only first learned of Rabbi Hollander zt"l passing on Matzav.com. However, in this story you quote Rabbi Hollanders own words stressing the importance of Jewish Unity and how separation is the first step towards idol worship. I would think that in an a tribute to Rabbi Hollander you would strive to great lengths to remain honest and sincere to his life's m ost vital calling. The author of this article clearly overlooked Rabbi Hollanders relationship with the Lubavitcher Rebbe, whom seated him at the dais upon appearing at Farbrengens. In fact, Rabbi Hollander at one point in his Rabbinical position was thinking of taking a sabbatical and upon telling the Rebbe of his plans the Rebbe responded, "40 years I have not taken a day off, you have no right as a Rabbi to leave the Rabbinate. It was this meeting that reinvigorated Rabbi Hollander and infused him with the moral strength and fortitude to continue for many more years fanning the dim flames of the Russian Community in Brighton Beach. When will this cowardice end? Its time to take a stand and tear down the "Berlin Wall" that divides us. Moshiach is knocking at the door but it is too thick to hear his knocks. There are plenty of Jewish news circuits on the web – another one just like it we don't need. If you are ready to take a stand then you are not just 'another reporter' but unique and the only one of your kind. You are the only one of your kind to print this story, recognizing Rabbi Hollander for who he was, now take it to the next step. Make Rabbi Hollander happy and most of all make our Father in Heaven happy. >To our sorrow he had no children so those who feel close to him should do something to memorialize his personality. He leaves a widow, so if anyone wants to do anything, he or she should look in on a lonely almanah without children or grandchildren and make sure she continues to live and be well. It overlooked his relationship with the Satmar Rebbe, R. Joel Teitelbaum, I believe the niftar would go to him on Hoshano Rabbo annually, a chutzpah, the website must be anti-Satmar for not mentioning his relationship with the (Satmar) Rebbe. Lubavitch only see themselves.In their publications they only discuss their own, yet they have the gall to criticize others!!! Rabbi Hollander, when talking to the Rebbe has a very Litvishe Yiddish. So my question to you is whether you are sure he was of Hungarian extraction, and do you know if he was born in the U.S? Obviously he could have picked Yiddish up from his Litvishe rebbeim in REITS. The video which "webjem" linked here, was of Rabbi Hollander z"l recollecting the mayse about retiring, and its follow-up. AGAV, K'Nireh he indeed WAS oisek in Rabbonus for a while after? Chaim -he was born in Hungary. This is actually piece for a bit ago, but I'd thought it would be read only up here. Someone there clarified that the Frierdiker Chabad Rebbe had one by the Rebbe ZY"A's chasuna - but of a different nature, a meal paid by the FR, but not a chaluka..
מנהג ישראל, שכאשר עורכים חתונה, הרי נוסף לסעודת חתן וכלה וסעודת הקרובים - עורכים במיוחד סעודת עניים, ואין זה עניין של נתינת מעות, אלא זהו כדי לשתף העניים בשמחה. כך אמר רבינו בשנת תשל"ו (שיחו"ק תשל"ו ח"ב, כמ' 461), וחזר ביתר שאת על-כך בשנת תנש"א.
RH 0"H came every year on Hoshana Rabbo night to Williamsburg. (not only to Satmar).I remember him standing in Tzelemer shul listening to the Tzelemer Rov Zt"l layning Mishna Torah. yehi zichro boruch. The death of Rabbi Hollander is a great tragedy. He was a strong, respected, proud and important voice for Orthodox Jewry for over half a century! Perhaps there is some divine meaning and serious symbolism that he passed away in a ripe old age on the eve of a new perplexing inauguration in America, much like the Chofetz Chaim passed away in his ripe old age in 1933 on the eve of Europe's fall into darkness. After a parsha that says: "Vayakom melech chadash asher lo yada es Yosef." There is what to worry about, as no doubt Rabbi Hollander would have warned us. Vehamevin yavin. Rabbi Hollander was a Gadol of the Rabbonus. In many ways he is the last of the great practical rabbinics Mohicans, a serious Modern Orthodox rabbi with a true love of Charedim and Chasidim and a Charedi Hashkofa and a love of Chasidus living fully in the modern world (he read newspapers and watched TV news) and never tiring of reminding his listeners, readers and admirers that only Toira iz di beste sechoira! Always ably assisted and supported to the hilt by his life-long wife and choshuve aishes chayil, herself the daughter of the Fortman rabbinic family, whom he adored and consulted with on most issues. He was the mumcha among the rabbonim and what he thought, said, wrote and preached was the golden standard of Yiddishkeit that you could use as a never-failing yardstick to measure everything by. Rabbi Hollander was clearly the ONLY Rov who painted a clear line in the sand that put all Orthodox Jews and rabbis as being on side, with the Reform and Conservative movements (they are NOT "Judaism" he passionately reminded the world) and their clergy as he called them (and NOT "rabbis") on the other side. He never hid his admiration for his Rebbeim, such as Rav Yoshe Ber Soloveitchik of YU, Rav Moshe Feinstein on the Agudas Harabonim, the Lubavitcher Rebbe for whom he had a very strong fond spot in his heart and the Satmar Rebbe whose eitzas and brochas he sought out. He was a pikeiach atzum! With a twinkle in his eye and a bemused outlook on people and the world. He did not suffer fools or krumkeit gladly. A tireless Marbitz Torah, brilliant orator, effective diplomat, columnist, debater and polemicist, Ohev Yisroel and YES a true non-political Zionist motivated by Ahavas Yisroel and Eretz Yisroel as well as of Medinas Yisroel defending Israel, a linguist and both scholar in worldy matters and a boki in Torah and Shas with always the right quip, posuk or chazal. A fighter and global thinker and tireless traveler to assist the Klal, darshan and doer on behalf of Jewry and Torah Judaism. An Ish Emes that fought for the Emes al pi Toras Hashem Emes! Baruch Dayan HaEmes. Emes me'eretz titzmach! The Union of Orthodox Rabbis of the United States and Canada (Agudath Harabonim) hereby declares: Reform and Conservative are not Judaism at all. Their adherents are Jews, according to the Jewish Law, but their religion is not Judaism. 1) The Agudath Harabonim has always been on guard against any attempt to alter, misrepresent or distort the Halacha (Jewish Law) as transmitted in the written an oral law, given by G-d through Moses on Sinai. It has therefore, rejected recognition of Reform and Conservative movements as Judaism, or their clergy as Rabbis. It has publicly rebuffed the claim of “three wings of Judaism.” There is only one Judaism: Torah Judaism. The Reform and Conservative are not Judaism at all, but another religion. 3) Having caused havoc in the United States, leading generations of Jews toward assimilation and intermarriage, they now attempt to export their alien ideology to Israel. By promoting pluralism in Judaism, they seek to be recognized as rabbis entitled (contrary to existing law in Israel) to carry out Rabbinical functions, such as marriage, divorce, and conversion, contrary to Torah Law. 4) In addition to the above, from a Torah perspective, it is imperative to support Israel’s government in their refusal to change the status quo regarding the exclusive Orthodox Rabbinic authority. Even non-orthodox political leaders recognize that unless Jewish religious family law remains under the authority of the sole Rabbinate, the Jewish nation would be hopelessly divided. b) The Lubavitcher Rebbe, zt”l: The doctrines and ideologies of the Reform and Conservative movements, can only be classed in the category of heretical movements which have plagued our people at one time or another, only to disappear eventually, having no basis in our everlasting Torah, the Torah of truth, the living Torah, Toras Emes, Toras Chaim. c) Rabbi Joseph B. Soloveitchik, zt”l: The Karaites of the Geonic period were closer to Judaism than are the Reform of our time. 6) We appeal to our fellow Jew, members of the Reform and Conservative movements: Having been falsely led to believe by heretical leaders that Reform and Conservative are legitimate branches or denominations of Judaism, we urge you to be guided by this declaration, and withdraw from your affiliation with Reform and Conservative temples and their clergy. Do not hesitate to attend an Orthodox synagogue due to your inadequate observance of Judaism. On the contrary, it is because of that inadequacy that you need to attend an Orthodox synagogue where you will be warmly welcomed. 7) You, surely want your children and grand-children to remain Jewish and be qualified to marry Jews everywhere, make certain, then, to be guided by an Orthodox Rabbi in all areas of marriage, divorce, conversion, etc. 8) These are critical days for the State of Israel, under continuous threat by the Arabs and their allies throughout the world. Our return to Torah, in Israel and in the diaspora, will merit us to receive G-d’s help and guidance. It is prohibited to pray in a non-Orthodox Temple at any time. If one does not have an Orthodox synagogue within walking distance, one should pray at home. This is so even on Rosh Hashonah. One must not pray in a Conservative of Reform Temple, even if it means not hearing the blowing of the Shofar. This ruling is affirmed by the prior ruling of such Torah luminaries as Hagaon Reb Moshe Feinstein, zt'l, the late president of the Union of Orthodox Rabbis, and Hagaon Reb Joseph B. Soloveitchik, zt'l, of Boston, the late honorary president of the Union of Orthodox Rabbis. Therefore, we call upon all Jews to discontinue to pray any time in a Conservative of Reform temple and instead pray in an Orthodox synagogue. If you have no Orthodox shul within walking distance, then pray at home. May G-d grant that both the laity and the clergy of the Reform and Conservative movements will be guided by the light of the Torah to abandon their erroneous ways and through genuine Teshuva (repentance) return to Torah-Judaism." "Kiruv and Halacha: In answer to many inquiries whether the Agudas Harabonim approves of the 'Shabbat Across America/Canada' calls...one is not allowed to pray in Reform and Conservative Temple...Therefore [it] cannot approve of a call to attend a Reform or Conservative Temple on a Friday night..."
Rabbi Hollander was definetely of Hungarian origin. I heard him speak in Yiddish and his Yiddish was klal Yiddish certainly not a White Russian-Lithuanain Yiddish. I think its also important to mention some other pioneers in assiting religious life in Russia. These were rabbi Harry Bronstein, rabbi Pincus Teitz. and Rabbis Arthur Scneier and Rabbi Chaim Twersky all visited Russia numerous times and were invovled in aiding the survival of Jewish life there. who was Rabbi Twersky that you mentioned? Rabbi Hollander zatzal was a good man, unfortunately he did not sufficiently distance himself from Lubavitch, especially in recent years, maybe because he felt that he needed them to work with the Russian Yidden in his neighborhood. As a result, the levaya was marred by having arch-messianist R. S. Butman as M.C. and having it announced that the aron will be passing by 770, before taking off to EY, in addition to the desecration of the big picture of the Rebbe and other Lubavitcher parapharnelia in his Shul, which it seems Lubavitch may be - G-d forbid - trying to take over gradually. Oy lioso busha, oy lioso chlima, a fine man who fought for emes and real Yiddishkeit should go out of this world of sheker in such a way, hijacked by Lubavitcher messianists. This should be a lesson to people to be careful, even if you mean well, be careful who you associate with, watch out for smiling messianists. Rav Hollander tragedy, the only tragedy is that buffoons like you can mar an event that should bring us to achdus and ahavas yisroel, not moronic hate like you preach. What you write is no chidush.Lubavitch believe that every single Jew should and will become a Lubavitcher.All their preaching that the Rebbe told people who became close to keep levush and minhogei kodesh is just twisting the truth to make them less scarier to others.The fact of the matter is that very few gevoreneh Lubavitchers keep their levush and give it over to their children.One famous case is Twersky the Rachmastrivkes son who's father had a fit when he became Lubavitch and the Rebbe promised they would keep the levush. That man had a spine of titanium. I really should try to get more of that interview digitized and uploaded. He tells three hours of incredible stories, many untold details of the relationships between the Gedolai Yisroel of the last generation. "I would say that the Rebbe changed the destiny of Judaism in America and the Rebbe’s single greatest accomplishment according to me, my opinion, which nobody ever did before and only a brilliant pious mind like his could conceive of it, was the idea that he has representatives in every nook and corner of the world! Who else has it, nobody else, I mean nobody even thought of such a thing and when he started it, it was an impossible thing but the fact remains that with everything that the Rebbe started it did succeed very well but this- more success then anything else, you know very well if there is town, an island, a place anywhere in the world, you will find a Lubavitcher representative there, that is something most unique and not only that it has become a career and a professional career, not something, you know done one two three, its something that is done with pride and with dedication and of course Chabad Houses on the doorsteps of universities, whoever would dream that people would and davka with beards are the ones who are carrying out such an activity and yet its known throughout the world right now; so if you ask me about Judaism in America, I’m saying to you that the Rebbe changed the whole destiny and way of life in this country." "so if you ask me about Judaism in America, I’m saying to you that the Rebbe changed the whole destiny and way of life in this country." Is Rabbi Hollander saying that without Lubavitch Judaism in America would have been totally different?? There were Orthodox Jews here before Chabad and with all due respect there would have been Orthodox Jews here without Chabad. Chabad has done nice outreach work to their credit.They have also done lots of "inreach" and our esteemed blogger, Tzig, is such an example.Would all these people be non religous without Chabad?I think not. That's without getting in to all the other stuff the Lubavitchers brought in, that have had a terribler effect on Orthodox youth. "As a result, the levaya was marred by having arch-messianist R. S. Butman as M.C. and having it announced that the aron will be passing by 770, before taking off to EY, in addition to the desecration of the big picture of the Rebbe and other Lubavitcher parapharnelia in his Shul, which it seems Lubavitch may be - G-d forbid - trying to take over gradually." tactic! Off course they''ll take over his shul! And of course they''ll turn him from someone who admired and respected the Rebbe amongst other rabbonim into the biggest Chabadsker chosid ever. What else is new?That Lubavitch is "culoi sheker'?? Shmerel: What Rabbi Hollander is saying seems to be clear. Incidentally, I don't think that quote is terribly novel, or earth shattering. That Judiasm is different for the presence of Lubavitch, even our biggest opponents admit. Absent their (widespread and sinister) influence, why oppose? I'm kind of new to this blog, but this seems like material that should already have been covered. "Nice outreach work" misses the point. We're talking about neshomos, tens of thousands of them, returned to klal Yisroel. The "change" he makes the case for is that Judaism could be viable outside Torah strongholds. That is a case I would defend to the death. Right! Only Satmar and Lakewood built Yiddishkeit! אזוי שטייט אין דער גמ" איו ע"ז וועגען די ערלים. ליידער "כ מיין אז מען קען עס זאגען וועגען די "טיירע" "כאבאדסקערס"
קידוש שם "כאבאד" חילול שם "כאבאד"
וואס פאר א פרעמדע זאך אין כרם ישראל איז דאס? Firstly I want to point out that you are nice and civil. If you are talking about Lubavitch making Judaism "viable" I simply don't agree, unless you can point out to me where. The Jewish communities which are viable are mostly populated by Orthodox and non Lubavitcher Jews, where Lubavitch generally come along and open up a shul for lazy stragglers who want to daven hours later than everyone else.They than set up pre-schools and schools,if they are lucky enough, growing by lowering the standards and again feeding off Orthodox families.This has repeated itself over and over again.Monsey,5Towns,Flatbush etc etc. Off course Lubavitch is in many small communities, but very few if any have become viable.They just schlep on.Contrast that with a community in Dallas set up by non Lubavitch outreach that has grown by leaps and bounds and is very viable. Off course Lubavitchers will never agree, therefore I propose that you show examples of any community suddenly becoming "viable" because Lubab sent a guy who needed parnoseh over there. The one example I can maybe think of is Vegas, but in that case its the fastest growing large community of Jews and if Chabad was not there others would have opened the Jewish school. Firstly, you make remaining nice and civil a proposition of questionable viability. My standard doesn't include a minimum number of shulgoers, day schools or other institutions. Yiddishkeit lives in Jews, not buildings. 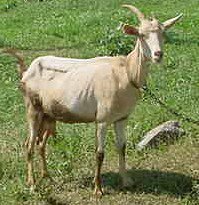 A young, frume couple that moves to the boondocks, who live and raise children who live according to Shulchan Aruch, and influence others to do the same is viable. To go to a place where there is no kosher meat, no cholov yisroel, and not a single shomer shabbos was, and aside for Lubavitch, remains, unheard of. That was what struck me as R' Hollander's point and that was the intent of my comment. I'm not sure what all that other stuff you're talking about is, but it is beside the point, and so is discussion of its accuracy. Schmerel, while Chabad may not be the predominant factor in the survival of Judaism here in America, it is foolish to diminish the importance it has played in the American scene. Yes, Lakewood under the leadership of RAK proved to be an influential force - transplanting the Lithuanian Yeshivah system to America - changing people of various not Lithuanian backgrounds (Poilisher, Hungarians, Galitzianer et al) into Litvishe Yidden . . . But REITS under the Rav, and Satmar under R' Yoelish, and yes Lubavitcher under the Rebbe, all played powerful roles - vying for the souls of the new generation. ("MO"), Zionistic group of American Jews . . . to something more right wing. There are communities - around the world - such as those of Los Angeles, Montreal, South Africa and Australia where the work of Lubavitch, while not the only flavor of Yiddishkiet, has been an integral part of the Orthodoxy there . . .
judaism in LA has been held back in the 18th century standards due to cunin and crew, who destroyed what was there before them and had to have things re started from scratch so it can be "chabad"
LA tragedy . . . That is a side issue, which while containing a valid point, is not fitting to bring in here . . . now. Lubab, leolom voed ubber alles! It seems like the Cunin-bashers are back in town... nu, nu. Heshy: was it time for a burp? Mottel: don't worry about "Heshy." i would like to clarify a few things with regard to the levaya. as someone close to Rabbi and Rebbitzin Hollander, i have a bit of insight as to what went on. Every Rov that was asked to speak was at the behest of the Rebbitzin herself. each person had a connection to Rabbi Hollander on some level. In addition, SHE requested that the aron pass by 770 so that is why it was. Rabbi hollander himself did not consider himself Lubavitch, nor a Chossid. he had a relationship with the Rebbe which he highly valued. he was indeed a great rabbi with strong principles and we respect him for that. personally, i find it reprehensible that people are choosing a man who managed to be good with every type of jew- and use him as a focal point for their hatred of every type of jew. what happened to calls for achdus? as soon as someone doesn't agree with you, you spew hatred and loathing and with a special venom reserved primarily for chabad. Rav Hollander was someone who reached out and associated with all types of orthodox jews, so this is particularly disturbing.